The Model 1590 sprinkler gauge comes in two configurations. The R-1590 retarded air pressure gauge is used in a dry system on the sprinkler head side of a control valve. It accurately monitors line air pressure, but also has the ability to accept up to 250 psi of water pressure upon activation. 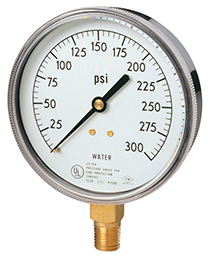 The P-1590 sprinkler gauge is used on the water supply side of the system to indicate available source pressure. It can also be used alone on a wet system where water is constantly available to the sprinkler head. Both 3½" gauges are approved by the Factory Mutual System and are listed by Underwriters’ Laboratories.